What crops do insects pollinate? It’s National Pollinator Week, and here’s a neat site for you–a complete list, continuously updated, of crops of importance to humans that insects pollinate. Some of the fruits and vegetables are obviously recognizable, and remember that clover and alfalfa are an important food crop for many of the animals we eat. There are also crops that produce a product that we use, like Neem or cotton. And, of premier importance to scientists everywhere: COFFEE and CHOCOLATE! Estimates vary, but the value is in the Billions. And that is just for bees–the estimates don’t include all the native pollinating insects, and other animal pollinators like birds and bats. So thank a pollinator when you have lunch today, or get dressed this morning. That looks like one of those buff-tailed bumbles from the UK (+EU). 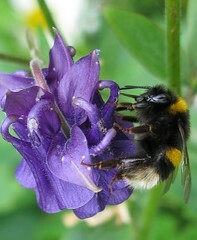 Bumbles are so much fun; have you petted a bumble for National Pollinator Week?